Next week, THEMIS, a visual and infrared camera designed at Arizona State University will pass 60,000 orbits of the Red Planet. It is carried on NASA's Mars Odyssey orbiter, the longest-operating spacecraft from any nation at Mars. Since arriving there, the ASU camera has taken nearly 400,000 images. The camera – the Thermal Emission Imaging System (THEMIS), which operates in five visual and nine infrared (heat-sensitive) "colors" – was designed by ASU professor Philip Christensen, the instrument's principal investigator. "Mars Odyssey's enduring success has let THEMIS achieve a longer run of observations than any previous instrument at Mars," says Christensen, Regents Professor of Geological Sciences and the Ed and Helen Korrick Professor in the School of Earth and Space Exploration at ASU. 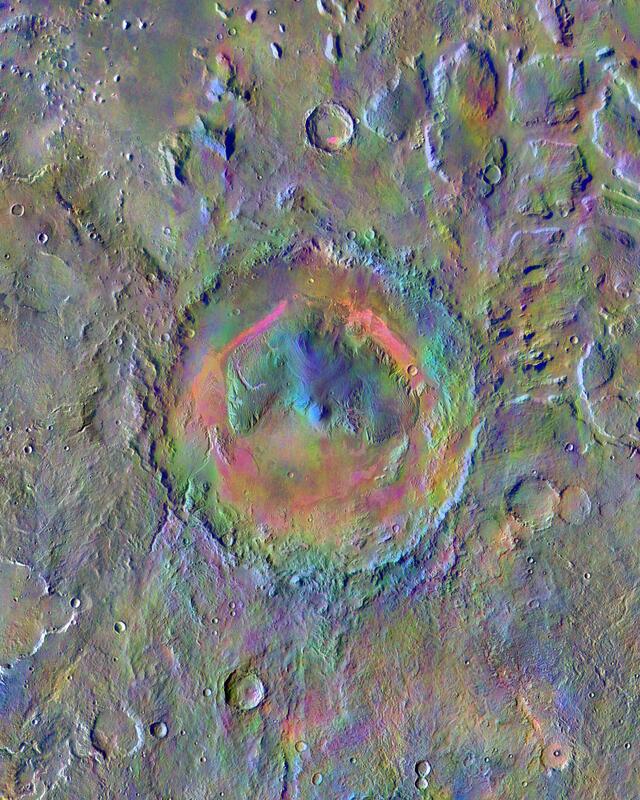 "THEMIS has thus provided the context for most recent Mars scientific research. We're very grateful to the scientists, engineers, and technicians who have kept the spacecraft in good health." He adds, "THEMIS also continues a tradition of ASU instruments working at Mars. This began almost 20 years ago, with our Thermal Emission Spectrometer (TES), which flew on NASA's Mars Global Surveyor, operating from 1996 to 2006." Even today, Christensen says, he uses THEMIS in his class for first-year undergraduate students. He challenges the class to think of a Mars geology problem, and the students then target THEMIS to take images to resolve the question. "THEMIS brings space exploration directly into their studies at first hand," he says. As of this week, THEMIS has produced 208,240 images in visible-light wavelengths and 188,760 in thermal-infrared wavelengths. THEMIS images are the basis for detailed global maps and for identification of some surface materials, such as chloride salt deposits and silica-rich terrain. Its infrared imaging also indicates how quickly different parts of the surface cool off at night or warm up in sunlight, which provides information about how dusty or rocky the ground is. These observations have allowed scientists to map the properties of the surface materials over nearly all of Mars. A particular area of interest is 96-mile-wide Gale Crater, currently the exploration site of the Mars Science Laboratory rover, Curiosity. Mars Odyssey began orbiting the Red Planet on October 23, 2001. It will complete orbit 60,000 on June 23, 2015. "The spacecraft is in good health, with all subsystems functional and with enough propellant for about 10 more years," says Mars Odyssey project manager David Lehman of NASA's Jet Propulsion Laboratory. Besides conducting observations, Odyssey also serves as a crucial communications relay to Earth for the two active rovers, Curiosity and Opportunity, operating on the Martian surface. In 2014, Odyssey began a gradual drift in its orbit designed to begin passing over terrain lit by early morning sunlight rather than afternoon light. In its orbit, the spacecraft always flies near each pole. Its current orbit flies along the "terminator" line between night and day both on the northbound and southbound halves of each circuit. The drift will be halted later this year with a maneuver to lock in the Martian time of day that Odyssey crosses the equator. The goal of the orbit change is to let THEMIS systematically observe the Martian atmosphere and surface shortly after local sunrise. This is to detect transient atmospheric features such as frosts, fogs, hazes, and clouds that burn off or vanish as the Martian day goes on. Already, an example of this are the clouds that gather around the upper slopes and in the vast summit pit (caldera) of Arsia Mons. This is one of the giant volcanoes in the Tharsis area, with a summit that reaches about 12 miles (20 kilometers) above the average radius of Mars, a datum that serves as "sea level." Christensen says, "Pursuing a 'dawn patrol' with THEMIS gives us hope we can catch in the act and study daily effects, seasonal ones, and even those which we think change from year-to-Martian-year." 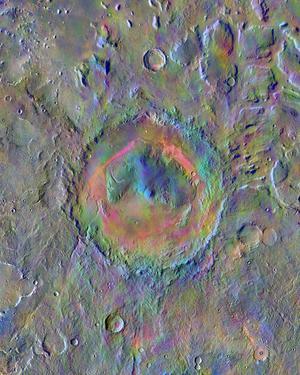 Nearly a hundred miles wide, Gale Crater, home to the Mars rover Curiosity, shows a new face in this mosaic image made using data from the Thermal Emission Imaging System (THEMIS). The colors come from an image processing technique that identifies mineral differences in surface materials and displays them in false colors. For example, wind-blown dust appears pale pink and olivine-rich basalt looks purple. The bright pink on Gale's floor appears due to a mix of basaltic sand and wind-blown dust. The blue at the summit of Gale's mound probably indicates a different kind of local material exposed there. The typical average Martian surface soil looks grayish-green. Scientists use these false-color images to identify places of potential geologic interest. Seen shortly after local sunrise, clouds gather in the summit pit, or caldera, of Pavonis Mons, a giant volcano on Mars. The clouds, which are mostly made of ice crystals, appear blue because they scatter blue light more strongly than other colors. The highest elevation of Arsia lies about 9 miles high, and the caldera spans about 29 miles wide. This image was made by the Thermal Emission Imaging System (THEMIS) through three of its visual-light filters plus a near-infrared one, and it is approximately true in color.